Whether you are a Halloween fan or not, you must agree, that there are a lot of fun and yummy foods out there for this spooky night! 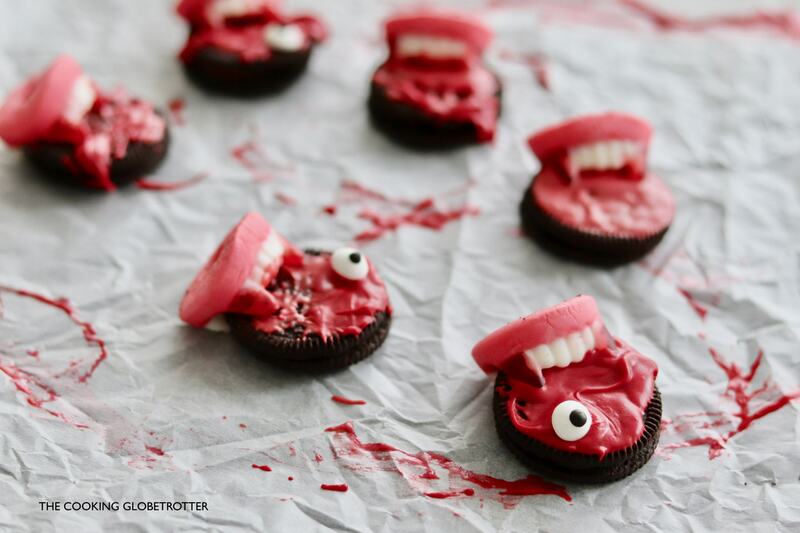 If you are looking for a quick fix with MINIMAL effort and MAXIMUM wow effect, go on and then check out this bloody vampire cookie bites! I can’t really call it a recipe, it’s more like an assembly line.. So easy, you can definitely get your kids to help you out! If you are willing to, you can definitely bake your own cookies, but try to make them thick as least as Oreos. or you can make your icing sugar and colour it. I recommend you use good quality food gel colours. 1. Melt the chocolate in the microwave. Alternatively, prepare your icing sugar. 2. Mix in 1-2 drops of dark red food gel colour. 3. With a spoon or a brush pour it on your cookies, do it messy, you do not want it to be perfect. 4. 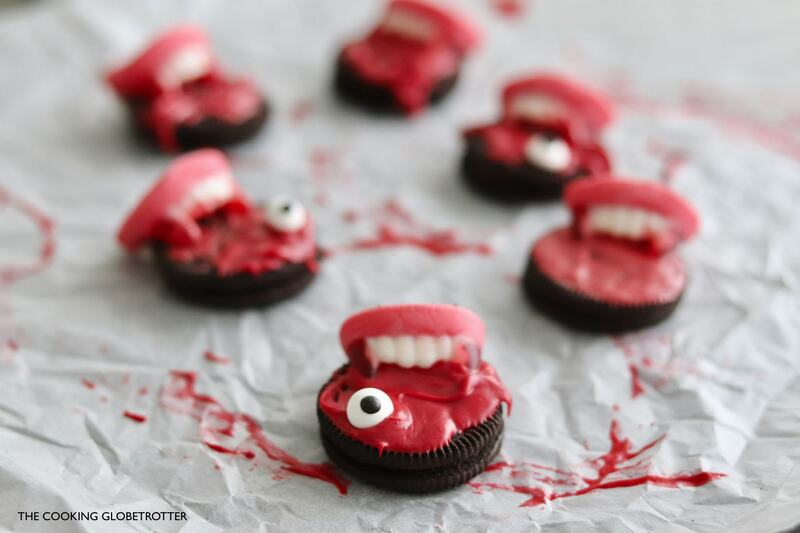 While it’s still soft, add the vampire teeth candy as if it was biting the cookie and if you want, add on or to eyes. 6. Use the leftover icing to decorate a baking sheet or your presentation plate! Looking for another great treat? 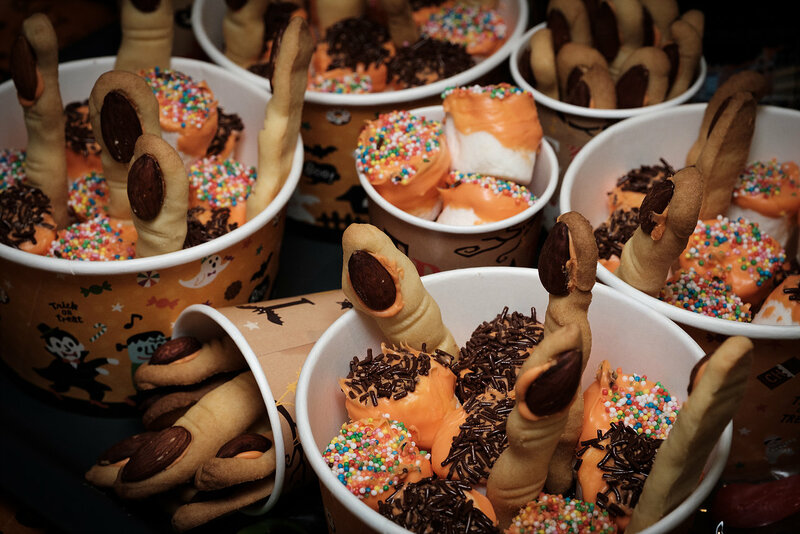 Check out my Witch Fingers Cookies!! Foodblogger Globetrotter sharing recipes from around the world, using natural ingredients and only a few simple steps, cooking and baking everything in moderation. Come with me on a culinary journey around the world! Don’t miss a recipe, subscribe to my newsletter! Data Content Policy * I would like to receive the latest recipes and agree to the data content policy. Please check your inbox to confirm and finalize your subscription. Did you subscribe to my newsletter? Click here to do so and I'll take you on a culinary journey around the world!